Throughout the framework of America’s secondary road system, county highways and recreational trails stand tens of thousands of older timber-frame and steel bridges. Many of these bridges are nearing or have already reached the end of their expected service life and are placing financial strains on counties as they require extensive maintenance and repair dollars to keep up with state and federal bridge safety standards. Many of these structures are on roads that do not receive the high traffic counts of a more urban infrastructure, however their importance is no less. Billions of dollars in agricultural trade rely on a safe and reliable secondary road system where farmers and ranchers can move crops and livestock quickly and efficiently to and from markets. Guthrie County, Iowa, has more than 150 timber-frame bridges that it is currently in the process of replacing. Over the past several years, the county has begun to utilize larger-diameter corrugated metal pipe (CMP) structures as an efficient and effective means of replacing its older and unsafe bridges. By utilizing underground CMP structures, municipalities such as Guthrie County are able to provide structures that do not require guardrails (an ever increasing area of importance in rural areas where farming implements are becoming larger), do not require special load postings, and require minimal inspections and maintenance. For one particular bridge replacement, Guthrie County was replacing a 22-ft-long-by-16-ft-wide timber bridge that had no record of installation date. The county engineer considered three replacement options based on the size of the drainage area and required hydraulics at the site. Option 1 was a single 6-ft-by-7-ft reinforced concrete box, option 2 was a single 84-in. CMP, and option 3 was a twin run of 60-in. corrugated metal pipes. When the cost analysis was completed, the single run of 84-in. CMP was the clear winner. Comparing the single run of 84-in. 10-gauge 3-by-1 CMP option to the concrete box option, Guthrie County assistant engineer Ethan Shelter, who oversaw the project, noted the county realized a 57% savings in installation costs and a nearly four-week savings in installation time. The county also was presented an option of using Metal Culvert’s Zebra Pipe on this particular project. This product is a “hybrid” CMP product that is constructed with both traditional galvanized steel on the top half of the pipe, and polymer-coated steel on the bottom half (invert) of the pipe. The Zebra Pipe (as named by a customer who first saw the pipe and claimed it looked like a zebra) provides an economical choice to end users who are interested in providing protection at the pipe’s most susceptible point for corrosion—the invert. 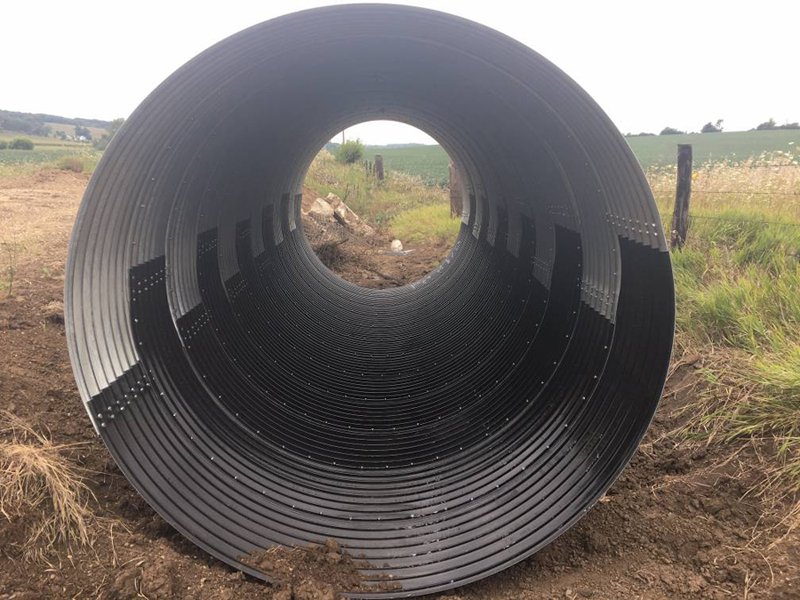 Metal Culverts offers Zebra Pipe in diameters from 48 to 144 in., standard and 3-by-1 corrugations, and round and arched profiles. According to Shelter, the location of this pipe included runoff from a large cattle feedlot, as well as its location under a fairly well traveled and important section of road, made choosing a product with the added protection of polymer coating and a 100-year service life an easy choice.